Arizona Geological Society - Florence Copper: Copper Recovery Using In-situ Technology By Dan Johnson BSc, MSc, PE – Vice-President | General Manager, Florence Copper Inc.
Florence Copper: Copper Recovery Using In-situ Technology By Dan Johnson BSc, MSc, PE – Vice-President | General Manager, Florence Copper Inc.
Non-members RSVP here. Registration requires online prepayment via credit card. The reservation process will not be complete without prepayment. Please cancel by 11 a.m. on the Friday prior to the meeting, if you are unable to attend - no shows and late cancellations will result in the forfeiture of their payment, if AGS is unable to sell your dinner. Members RSVP here. Registration requires online prepayment via credit card. The reservation process will no be complete without prepayment. Free to Student members thanks to Freeport-McMoRan, Inc. Full-time students may join online free - click "Join or Renew"
Please cancel by 11 a.m. on the Friday prior to the meeting, if you are unable to attend - no shows and late cancellations will be invoiced, if AGS is unable to sell your dinner. By Dan Johnson BSc, MSc, PE – Vice-President | General Manager, Florence Copper Inc.
Abstract: The Florence Copper In-Situ Copper Recovery (ISCR) project hosts a near-surface porphyry copper deposit located in Florence, Arizona. The copper oxide portion of the deposit comprises a measured and indicated resource of 429.5 million tons grading 0.331 percent total copper for a contained 2.84 billion pounds copper at a 0.15% total copper cutoff. The Florence Copper porphyry deposit is buried by a minimum of 370 feet of unconsolidated basin-fill formations, consisting of Tertiary-Quaternary gravels, fines, and alluvium. It formed when numerous Laramide-age dike swarms of granodiorite porphyry intruded Proterozoic quartz monzonite. Hydrothermal solutions associated with the intrusive dikes altered the host rock and deposited copper and iron sulfide minerals in disseminations and thin quartz-sulfide veinlets. The region was later faulted and much of the Florence deposit was isolated as a horst block. This horst block was exposed to weathering, intense fracturing (material resembles porous media), and erosion. Fluctuations occurred in the water table level over time causing the rock to be dissolved by naturally formed acids and were remobilized along fractures and re-deposited, generally at a lower elevation. The copper sulfide minerals in the oxidized zone above the water table were converted to copper silicates and copper oxides, primarily chrysocolla and tenorite. The alluvial zone above the oxide consists of two distinct groundwater production units (the upper and lower basin fill groundwater units) separated by a clay aquitard. The highly fractured natured of the rocks in the oxide portion of the deposit, the presence of the aquitard in the alluvium above, and the abrupt change from the oxide to sulfide mineralization below creates excellent conditions for ISCR. Florence Copper confines the ISCR production to the oxide bedrock unit by maintaining hydraulic control of the injected solutions within these confining units. Former owner BHP Copper conducted extensive geological and metallurgical studies at the Florence Copper site, including the installation and operation of over 50 injection, production and monitoring wells to conduct ISCR production testing. The ISCR testing was initiated in 1997 and conclusively demonstrated hydraulic control of the ISCR process at Florence. Following a major decline in world copper prices in late 1998, BHP Copper shut down the ISCR testing prior to metallurgical evaluations and divested its interests in the Florence Copper project to a private developer in 2001. Following a major decline in residential development in Arizona, Curis Resources Ltd (TSX: CUV) acquired a 100% interest in the property in December 2009 to seek the development of the Florence Copper ISCR operation. In 2014, Taseko Mines Ltd. acquired Curis Resources Ltd. and secured operating permits for a one-year Production Test Facility (PTF), which commenced operations on Dec. 14, 2018. The PTF, also known as Phase 1 operations, is a small-scale demonstration of ISCR and consists of a series of injection, recovery, observation and perimeter monitoring wells. The soluble copper mineralization is extracted using ISCR, which involves injecting a dilute acidic solution into the oxide zone that dissolves the copper mineralization as it passes through the naturally occurring fractures in the oxide deposit. Enriched copper solution is then processed by using commercially-proven solvent extraction/ electro-winning technology. Florence Copper is estimated to create close to 500 jobs for Pinal County and create $3.4 billion in economic activity for the state of Arizona throughout the 27-year commercial life of the project. 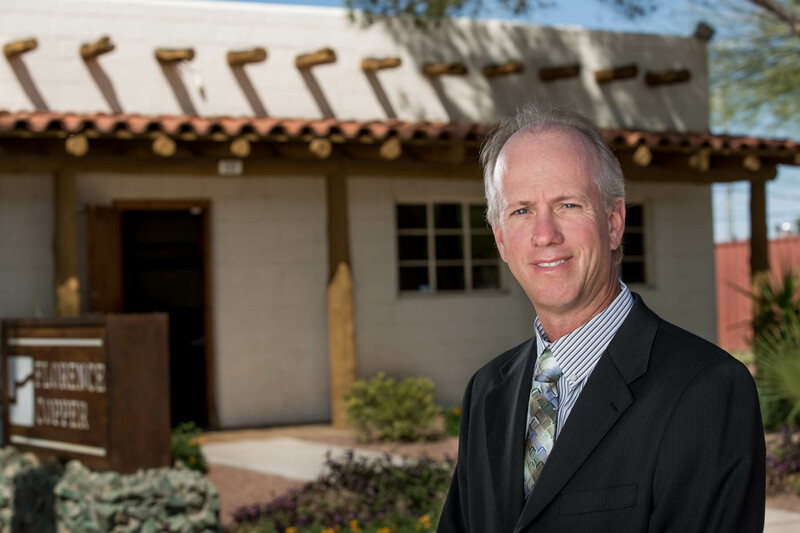 Bio: Dan Johnson is a resident Arizonan with a career spanning over 25 years of environmental management, hydrological engineering, and project management experience in the state's mining industry. Dan is a graduate of the University of Arizona, and is a registered Geologist, Hydrologist, and Professional Engineer. Prior to joining Florence Copper, Dan worked with QuadraFNX, where he served as Technical Services and Environmental Manager/Director for projects in North America and Chile. He has also worked at senior levels for Phelps Dodge, Freeport-McMoran, Rio Tinto, and Montgomery Watson. Dan joined Florence Copper in 2011 and has led the company's environmental, permitting and technical efforts with the support of the project team. He currently sits on the Arizona Mining Association Board of Directors as Secretary/Treasurer.